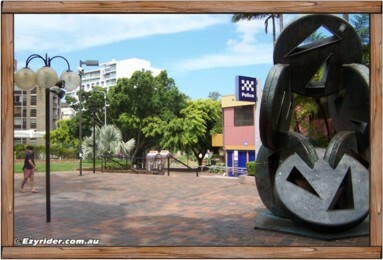 ﻿ Kings Cross to Rushcutters Bay Park Walking Directions & Information. Click on the links above for other picture galleries. .. At the bottom of the page are location maps of this area ..
which also shows the map walking directions to Rushcutters Bay Park. The walk is approximately 5-10 minutes. A visit to this area is highly recommended. If you are considering a place to live in Sydney,the area of Potts Point/Elizabeth Bay is ideal for the best of all worlds. 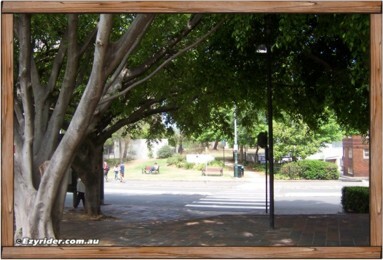 The tree lined walk down Elizabeth Bay Road gives you an idea of why this area is so popular. 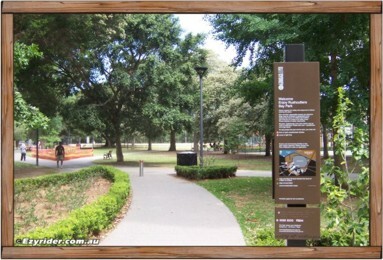 Enjoy your walk and enjoy the natural pleasures of Rushcutters Bay Park. 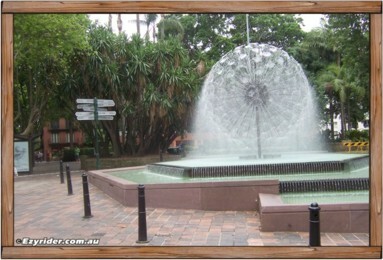 When you arrive at the El Alamein Fountain and Fitzroy Gardens, to your right is the Police Station. Behind the Police Station is parking. 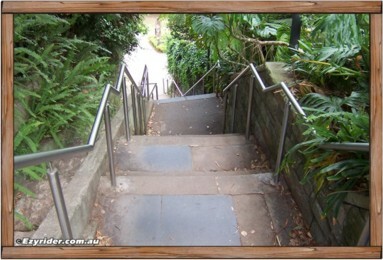 Head towards the stairs and walkway down towards Elizabeth Bay Road. 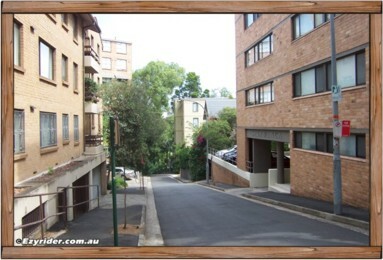 There is a walkway down on your left, or the stairs to your right, and in the background you will see the walkway crossing over Elizabeth Bay Road. 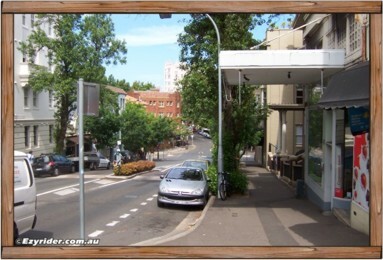 Go across the crossing and turn left down the footpath. 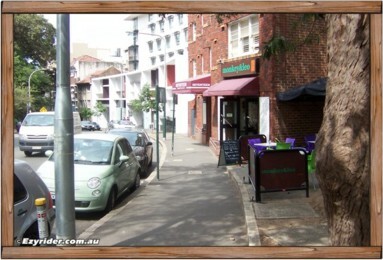 Head down Elizabeth Bay Road, where you will go past a small cafe, a real estate agent, and apartments. Down a little further there is a restaurant near the corner with a roundabout in the background. Turn right at the corner, where there is another small cafe. 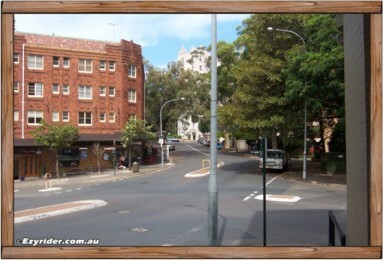 After turning right, head further down Elizabeth Bay Road. In the background is a red brick unit block. 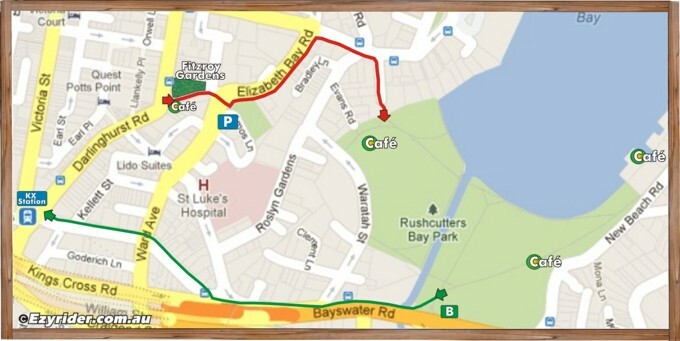 This is where you will turn right to head down to Rushcutters Bay Park. The building on your left has units and a variety of shops on the ground level. 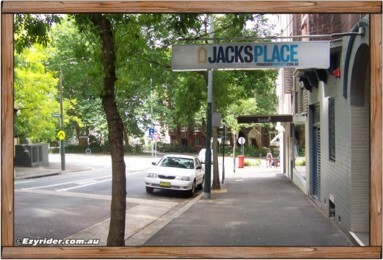 I lived in this building, a peaceful, relaxing area with a friendly village atmosphere. Stay on this side of the road & cross the road in the front. 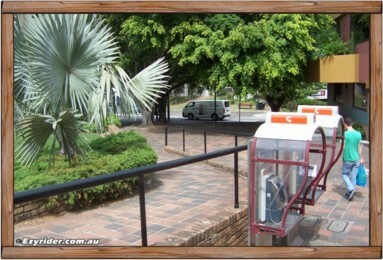 Once across the road there is a bus stop where the 311 bus will take you into the city. 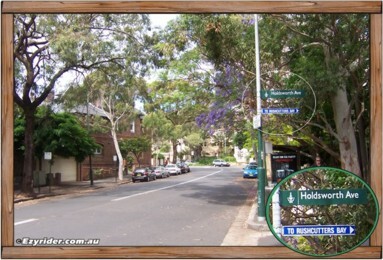 Just before the bus stop is Holdworth Ave and a sign that says 'To Rushcutters Bay'. 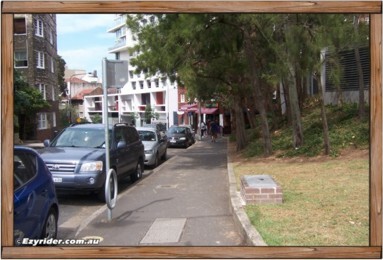 Head down Holdworth Ave where at the end of the road are steps down to Rushcutters Bay Park. 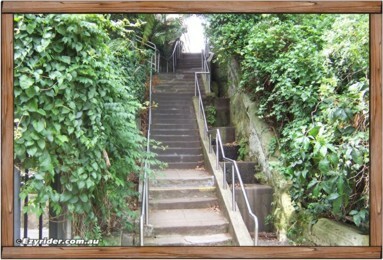 The stairs are historically old and steep but maintained well. Hold onto the railing! A view of the stairs looking up. 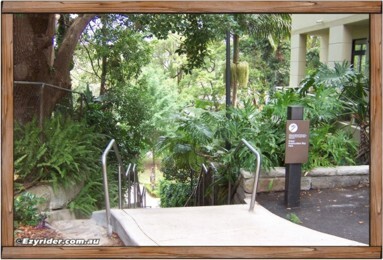 At the bottom of the stairs the start of Rushcutters Bay Park opens up to you with a welcoming entrance sign. Follow the park around via the footpath areas. The first map shows the location of Fitzroy Gardens, walkway directions to Rushcutters Bay Park (in red), Cafe's at the park, and an alternative walk back to Kings Cross. 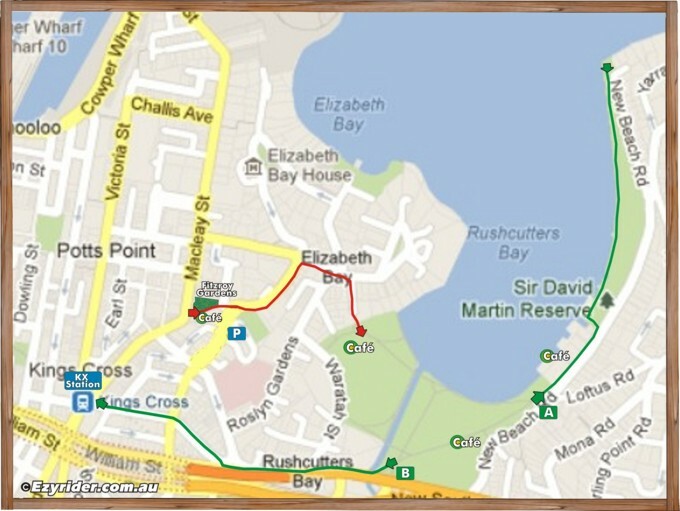 The second map shows the same plus an extended walk to the end of Sir David Martin Reserve. (B) Alternative walk back to KX. (A) Extend your walk to the end of the Sir David Martin Reserve and see the Harbour Bridge in the background.